Phil Murphy, the Governor of New Jersey, is keeping his campaign promise to parents, students, and educators, according to a news article just posted by the New Jersey Education Association (NJEA; see here). As per the New Jersey Commissioner of Education – Dr. Lamont Repollet, who was a classroom teacher himself — throughout New Jersey, Partnership for Assessment of Readiness for College and Careers (PARCC) test scores will now account for just 5% of a teacher’s evaluation, which is down from 30% as mandated for approxunatelt five years prior by both Murphy’s and Repollet’s predecessors. Alas, the New Jersey Department of Education and the Murphy administration have “shown their respect for the research.” Because state law continues to require that standardized test scores play some role in teacher evaluation, a decrease to 5% is a victory, perhaps with a revocation of this law forthcoming. Way to go New Jersey! Also last Thursday (it was a BIG day, like I said), I testified, again, regarding a similar provision (hopefully) being passed in the state of Nevada. As per a prior post here, Nevada’s “Democratic lawmakers are trying to eliminate — or at least reduce — the role [students’] standardized tests play in evaluations of teachers, saying educators are being unfairly judged on factors outside of their control.” More specifically, as per AB320 the state would eliminate statewide, standardized test results as a mandated teacher evaluation measure but allow local assessments to account for 20% of a teacher’s total evaluation. AB320 is still in work session. It has the votes in committee and on the floor, thus far. The National Center on Teacher Quality (NCTQ), unsurprisingly (see here and here), submitted (unsurprising) testimony against AB320 that can be read here, and I submitted testimony (I think, quite effectively 😉 ) refuting their “research-based” testimony, and also making explicit what I termed “The “Top Ten” Research-Based Reasons Why Large-Scale, Standardized Tests Should Not Be Used to Evaluate Teachers” here. I have also pasted my submission below, in case anybody wants to forward/share any of my main points with others, especially others in similar positions looking to impact state or local educational policies in similar ways. While I understand that the National Council on Teacher Quality (NCTQ) submitted a letter expressing their opposition against Assembly Bill (AB) 320, it should be officially noted that, counter to that which the NCTQ wrote into its “research-based” letter, the American Statistical Association (ASA), the American Educational Research Association (AERA), the National Academy of Education (NAE), and other large-scale, highly esteemed, professional educational and educational research/measurement associations disagree with the assertions the NCTQ put forth. Indeed, the NCTQ is not a nonpartisan research and policy organization as claimed, but one of only a small handful of partisan operations still in existence and still pushing forward what is increasingly becoming dismissed as America’s ideal teacher evaluation systems (e.g., announced today, Texas dropped their policy requirement that standardized test scores be used to evaluate teachers; Connecticut moved in the same policy direction last month). The ASA evidenced that teacher effects correlate with only 1-14% of the variance in their students’ large-scale standardized test scores. This means that the other 86%-99% of the variance is due to factors outside of any teacher’s control (e.g., out-of-school and student-level variables). That teachers’ effects, as measured by large-scaled standardized tests (and not including other teacher effects that cannot be measured using large-scaled standardized tests), account for such little variance makes using them to evaluate teachers wholly irrational and unreasonable. Large-scale standardized tests have always been, and continue to be, developed to assess levels of student achievement, but not levels of growth in achievement over time, and definitely not growth in achievement that can be attributed back to a teacher (i.e., in terms of his/her effects). Put differently, these tests were never designed to estimate teachers’ effects; hence, using them in this regard is also psychometrically invalid and indefensible. Large-scale standardized tests, when used to evaluate teachers, often yield unreliable or inconsistent results. Teachers who should be (more or less) consistently effective are, accordingly, being classified in sometimes highly inconsistent ways year-to-year. As per the current research, a teacher evaluated using large-scale standardized test scores as effective one year has a 25% to 65% chance of being classified as ineffective the following year(s), and vice versa. This makes the probability of a teacher being identified as effective, as based on students’ large-scale test scores, no different than the flip of a coin (i.e., random). The estimates derived via teachers’ students’ large-scale standardized test scores are also invalid. 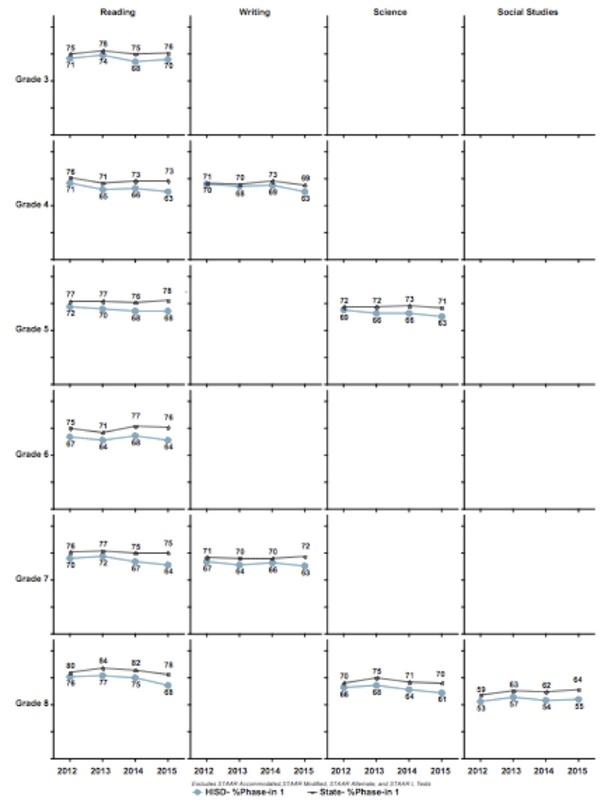 Very limited evidence exists to support that teachers whose students’ yield high- large-scale standardized tests scores are also effective using at least one other correlated criterion (e.g., teacher observational scores, student satisfaction survey data), and vice versa. That these “multiple measures” don’t map onto each other, also given the error prevalent in all of the “multiple measures” being used, decreases the degree to which all measures, students’ test scores included, can yield valid inferences about teachers’ effects. Large-scale standardized tests are often biased when used to measure teachers’ purported effects over time. 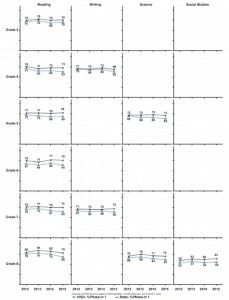 More specifically, test-based estimates for teachers who teach inordinate proportions of English Language Learners (ELLs), special education students, students who receive free or reduced lunches, students retained in grade, and gifted students are often evaluated not as per their true effects but group effects that bias their estimates upwards or downwards given these mediating factors. The same thing holds true with teachers who teach English/language arts versus mathematics, in that mathematics teachers typically yield more positive test-based effects (which defies logic and commonsense). Related, large-scale standardized tests estimates are fraught with measurement errors that negate their usefulness. These errors are caused by inordinate amounts of inaccurate and missing data that cannot be replaced or disregarded; student variables that cannot be statistically “controlled for;” current and prior teachers’ effects on the same tests that also prevent their use for making determinations about single teachers’ effects; and the like. Using large-scale standardized tests to evaluate teachers is unfair. Issues of fairness arise when these test-based indicators impact some teachers more than others, sometimes in consequential ways. Typically, as is true across the nation, only teachers of mathematics and English/language arts in certain grade levels (e.g., grades 3-8 and once in high school) can be measured or held accountable using students’ large-scale test scores. Across the nation, this leaves approximately 60-70% of teachers as test-based ineligible. Large-scale standardized test-based estimates are typically of very little formative or instructional value. Related, no research to date evidences that using tests for said purposes has improved teachers’ instruction or student achievement as a result. As per UCLA Professor Emeritus James Popham: The farther the test moves away from the classroom level (e.g., a test developed and used at the state level) the worst the test gets in terms of its instructional value and its potential to help promote change within teachers’ classrooms. Large-scale standardized test scores are being used inappropriately to make consequential decisions, although they do not have the reliability, validity, fairness, etc. to satisfy that for which they are increasingly being used, especially at the teacher-level. This is becoming increasingly recognized by US court systems as well (e.g., in New York and New Mexico). The unintended consequences of such test score use for teacher evaluation purposes are continuously going unrecognized (e.g., by states that pass such policies, and that states should acknowledge in advance of adapting such policies), given research has evidenced, for example, that teachers are choosing not to teach certain types of students whom they deem as the most likely to hinder their potentials positive effects. Principals are also stacking teachers’ classes to make sure certain teachers are more likely to demonstrate positive effects, or vice versa, to protect or penalize certain teachers, respectively. Teachers are leaving/refusing assignments to grades in which test-based estimates matter most, and some are leaving teaching altogether out of discontent or in professional protest. Note that the two studies the NCTQ used to substantiate their “research-based” letter would not support the claims included. For example, their statement that “According to the best-available research, teacher evaluation systems that assign between 33 and 50 percent of the available weight to student growth ‘achieve more consistency, avoid the risk of encouraging too narrow a focus on any one aspect of teaching, and can support a broader range of learning objectives than measured by a single test’ is false. First, the actual “best-available” research comes from over 10 years of peer-reviewed publications on this topic, including over 500 peer-reviewed articles. Second, what the authors of the Measures of Effective Teaching (MET) Studies found was that the percentages to be assigned to student test scores were arbitrary at best, because their attempts to empirically determine such a percentage failed. This face the authors also made explicit in their report; that is, they also noted that the percentages they suggested were not empirically supported. The state of Florida is another one of our state’s to watch in that, even since the passage of the Every Student Succeeds Act (ESSA) last January, the state is still moving forward with using its VAMs for high-stakes accountability reform. See my most recent post about one district in Florida here, after the state ordered it to dismiss a good number of its teachers as per their low VAM scores when this school year started. After realizing this also caused or contributed to a teacher shortage in the district, the district scrambled to hire Kelly Services contracted substitute teachers to replace them, after which the district also put administrators back into the classroom to help alleviate the bad situation turned worse. Throughout this piece Fantozzi covers the story of Elizabeth Keep, a teacher who was “plucked from” the middle school in which she taught for 13 years, after which she was involuntarily placed at a district high school “just days before she was to report back to work.” She was one of 35 teachers moved from five schools in need of reform as based on schools’ value-added scores, although this was clearly done with no real concern or regard of the disruption this would cause these teachers, not to mention the students on the exiting and receiving ends. Likewise, and according to Keep, “If you asked students what they need, they wouldn’t say a teacher with a high VAM score…They need consistency and stability.” Apparently not. In Keep’s case, she “went from being the second most experienced person in [her middle school’s English] department…where she was department chair and oversaw the gifted program, to a [new, and never before] 10th- and 11th-grade English teacher” at the new high school to which she was moved. As background, when Polk County School District officials presented turnaround plans to the State Board of Education last July, school board members “were most critical of their inability to move ‘unsatisfactory’ teachers out of the schools and ‘effective’ teachers in.” One board member, for example, expressed finding it “horrendous” that the district was “held hostage” by the extent to which the local union was protecting teachers from being moved as per their value-added scores. Referring to the union, and its interference in this “reform,” he accused the unions of “shackling” the districts and preventing its intended reforms. Note that the “effective” teachers who are to replace the “ineffective” ones can earn up to $7,500 in bonuses per year to help the “turnaround” the schools into which they enter. Likewise, the state’s Commissioner of Education concurred saying that she also “wanted ‘unsatisfactory’ teachers out and ‘highly effective’ teachers in,” again, with effectiveness being defined by teachers’ value-added or lack thereof, even though (1) the teachers targeted only had one or two years of the three years of value-added data required by state statute, and even though (2) the district’s senior director of assessment, accountability and evaluation noted that, in line with a plethora of other research findings, teachers being evaluated using the state’s VAM have a 51% chance of changing their scores from one year to the next. This lack of reliability, as we know it, should outright prevent any such moves in that without some level of stability, valid inferences from which valid decisions are to be made cannot be drawn. It’s literally impossible. Nonetheless, state board of education members “unanimously… threatened to take [all of the district’s poor performing] over or close them in 2017-18 if district officials [didn’t] do what [the Board said].” See also other tales of similar districts in the article available, again, here. VAM-based chaos reigns, especially in Florida. Last November, I published a post about “Houston’s “Split” Decision to Give Superintendent Grier $98,600 in Bonuses, Pre-Resignation.” Thereafter, I engaged some of my former doctoral students to further explore some data from Houston Independent School District (HISD), and what we collectively found and wrote up was just published in the highly-esteemed Teachers College Record journal (Amrein-Beardsley, Collins, Holloway-Libell, & Paufler, 2016). To view the full commentary, please click here. In this commentary we discuss HISD’s highest-stakes use of its Education Value-Added Assessment System (EVAAS) data – the value-added system HISD pays for at an approximate rate of $500,000 per year. This district has used its EVAAS data for more consequential purposes (e.g., teacher merit pay and termination) than any other state or district in the nation; hence, HISD is well known for its “big use” of “big data” to reform and inform improved student learning and achievement throughout the district. We note in this commentary, however, that as per the evidence, and more specifically the recent release of the Texas’s large-scale standardized test scores, that perhaps attaching such high-stakes consequences to teachers’ EVAAS output in Houston is not working as district leaders have, now for years, intended. See, for example, the recent test-based evidence comparing the state of Texas v. HISD, illustrated below. “Perhaps the district’s EVAAS system is not as much of an “educational-improvement and performance-management model that engages all employees in creating a culture of excellence” as the district suggests (HISD, n.d.a). Perhaps, as well, we should “ponder the specific model used by HISD—the aforementioned EVAAS—and [EVAAS modelers’] perpetual claims that this model helps teachers become more “proactive [while] making sound instructional choices;” helps teachers use “resources more strategically to ensure that every student has the chance to succeed;” or “provides valuable diagnostic information about [teachers’ instructional] practices” so as to ultimately improve student learning and achievement (SAS Institute Inc., n.d.). The bottom line, though, is that “Even the simplest evidence presented above should at the very least make us question this particular value-added system, as paid for, supported, and applied in Houston for some of the biggest and baddest teacher-level consequences in town.” See, again, the full text and another, similar graph in the commentary, linked here. Great news for New Mexico and New Mexico’s approximately 23,000 teachers, and great news for states and teachers potentially elsewhere, in terms of setting precedent! Late yesterday, state District Judge David K. Thomson, who presided over the ongoing teacher-evaluation lawsuit in New Mexico, granted a preliminary injunction preventing consequences from being attached to the state’s teacher evaluation data. More specifically, Judge Thomson ruled that the state can proceed with “developing” and “improving” its teacher evaluation system, but the state is not to make any consequential decisions about New Mexico’s teachers using the data the state collects until the state (and/or others external to the state) can evidence to the court during another trial (set for now, for April) that the system is reliable, valid, fair, uniform, and the like. As you all likely recall, the American Federation of Teachers (AFT), joined by the Albuquerque Teachers Federation (ATF), last year, filed a “Lawsuit in New Mexico Challenging [the] State’s Teacher Evaluation System.” Plaintiffs charged that the state’s teacher evaluation system, imposed on the state in 2012 by the state’s current Public Education Department (PED) Secretary Hanna Skandera (with value-added counting for 50% of teachers’ evaluation scores), is unfair, error-ridden, spurious, harming teachers, and depriving students of high-quality educators, among other claims (see the actual lawsuit here). Thereafter, one scheduled day of testimonies turned into five in Santa Fe, that ran from the end of September through the beginning of October (each of which I covered here, here, here, here, and here). I served as the expert witness for the plaintiff’s side, along with other witnesses including lawmakers (e.g., a state senator) and educators (e.g., teachers, superintendents) who made various (and very articulate) claims about the state’s teacher evaluation system on the stand. Thomas Kane served as the expert witness for the defendant’s side, along with other witnesses including lawmakers and educators who made counter claims about the system, some of which backfired, unfortunately for the defense, primarily during cross-examination. See articles released about this ruling this morning in the Santa Fe New Mexican (“Judge suspends penalties linked to state’s teacher eval system”) and the Albuquerque Journal (“Judge curbs PED teacher evaluations).” See also the AFT’s press release, written by AFT President Randi Weingarten, here. Click here for the full 77-page Order written by Judge Thomson (see also, below, five highlights I pulled from this Order). The PED continues to stand by its teacher evaluation system, calling the court challenge “frivolous” and “a legal PR stunt,” all the while noting that Judge Thomson’s decision “won’t affect how the state conducts its teacher evaluations.” Indeed it will, for now and until the state’s teacher evaluation system is vetted, and validated, and “the court” is “assured” that the system can actually be used to take the “consequential actions” against teachers, “required” by the state’s PED. 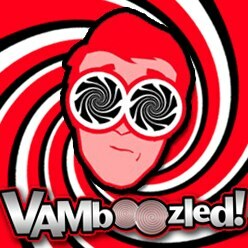 Validation Needed: “The American Statistical Association says ‘estimates from VAM should always be accompanied by measures of precision and a discussion of the assumptions and possible limitations of the model. These limitations are particularly relevant if VAM are used for high stake[s] purposes” (p. 1). These are the measures, assumptions, limitations, and the like that are to be made transparent in this state. Uniformity Required: “New Mexico’s evaluation system is less like a [sound] model than a cafeteria-style evaluation system where the combination of factors, data, and elements are not easily determined and the variance from school district to school district creates conflicts with the [state] statutory mandate” (p. 2)…with the existing statutory framework for teacher evaluations for licensure purposes requiring “that the teacher be evaluated for ‘competency’ against a ‘highly objective uniform statewide standard of evaluation’ to be developed by PED” (p. 4). “It is the term ‘highly objective uniform’ that is the subject matter of this suit” (p. 4), whereby the state and no other “party provided [or could provide] the Court a total calculation of the number of available district-specific plans possible given all the variables” (p. 54). See also the Judge’s points #78-#80 (starting on page 70) for some of the factors that helped to “establish a clear lack of statewide uniformity among teachers” (p. 70). Transparency Missing: “The problem is that it is not easy to pull back the curtain, and the inner workings of the model are not easily understood, translated or made accessible” (p. 2). “Teachers do not find the information transparent or accurate” and “there is no evidence or citation that enables a teacher to verify the data that is the content of their evaluation” (p. 42). In addition, “[g]iven the model’s infancy, there are no real studies to explain or define the [s]tate’s value-added system…[hence, the consequences and decisions]…that are to be made using such system data should be examined and validated prior to making such decisions” (p. 12). Consequences Halted: “Most significant to this Order, [VAMs], in this [s]tate and others, are being used to make consequential decisions…This is where the rubber hits the road [as per]…teacher employment impacts. It is also where, for purposes of this proceeding, the PED departs from the statutory mandate of uniformity requiring an injunction” (p. 9). In addition, it should be noted that indeed “[t]here are adverse consequences to teachers short of termination” (p. 33) including, for example, “a finding of ‘minimally effective’ [that] has an impact on teacher licenses” (p. 41). These, too, are to be halted under this injunction Order. Clarification Required: “[H]ere is what this [O]rder is not: This [O]rder does not stop the PED’s operation, development and improvement of the VAM in this [s]tate, it simply restrains the PED’s ability to take consequential actions…until a trial on the merits is held” (p. 2). In addition, “[a] preliminary injunction differs from a permanent injunction, as does the factors for its issuance…’ The objective of the preliminary injunction is to preserve the status quo [minus the consequences] pending the litigation of the merits. This is quite different from finally determining the cause itself” (p. 74). Hence, “[t]he court is simply enjoining the portion of the evaluation system that has adverse consequences on teachers” (p. 75). The PED also argued that “an injunction would hurt students because it could leave in place bad teachers.” As per Judge Thomson, “That is also a faulty argument. There is no evidence that temporarily halting consequences due to the errors outlined in this lengthy Opinion more likely results in retention of bad teachers than in the firing of good teachers” (p. 75). 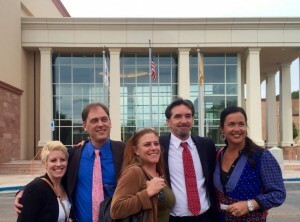 Finally, given my involvement in this lawsuit and given the team with whom I was/am still so fortunate to work (see picture below), including all of those who testified as part of the team and whose testimonies clearly proved critical in Judge Thomson’s final Order, I want to thank everyone for all of their time, energy, and efforts in this case, thus far, on behalf of the educators attempting to (still) do what they love to do — teach and serve students in New Mexico’s public schools. States of attention on this blog, and often of (dis)honorable mention as per their state-level policies bent on value-added models (VAMs), include Florida, New York, Tennessee, and New Mexico. As for a quick update about the latter state of New Mexico, we are still waiting to hear the final decision from the judge who recently heard the state-level lawsuit still pending on this matter in New Mexico (see prior posts about this case here, here, here, here, and here). Another locale of great interest, though, is the Houston Independent School District. This is the seventh largest urban school district in the nation, and the district that has tied more high-stakes consequences to their value-added output than any other district/state in the nation. These “initiatives” were “led” by soon-to-resign/retire Superintendent Terry Greir who, during his time in Houston (2009-2015), implemented some of the harshest consequences ever attached to teacher-level value-added output, as per the district’s use of the Education Value-Added Assessment System (EVAAS) (see other posts about the EVAAS here, here, and here; see other posts about Houston here, here, and here). In fact, the EVAAS is still used throughout Houston today to evaluate all EVAAS-eligible teachers, to also “reform” the district’s historically low-performing schools, by tying teachers’ purported value-added performance to teacher improvement plans, merit pay, nonrenewal, and termination (e.g., 221 Houston teachers were terminated “in large part” due to their EVAAS scores in 2011). However, pending litigation (i.e., this is the district in which the American and Houston Federation of Teachers (AFT/HFT) are currently suing the district for their wrongful use of, and over-emphasis on this particular VAM; see here), Superintendent Grier and the district have recoiled on some of the high-stakes consequences they formerly attached to the EVAAS This particular lawsuit is to commence this spring/summer. Nonetheless, my most recent post about Houston was about some of its future school board candidates, who were invited by The Houston Chronicle to respond to Superintendent Grier’s teacher evaluation system. For the most part, those who responded did so unfavorably, especially as the evaluation systems was/is disproportionately reliant on teachers’ EVAAS data and high-stakes use of these data in particular (see here). More importantly, take a look at the two figures below, taken from actual district reports (see references below), highlighting Houston’s performance (declining, on average, in blue) as compared to the state of Texas (maintaining, on average, in black), to determine for yourself whether Superintendent Grier, indeed, deserved such a bonus (not to mention salary). 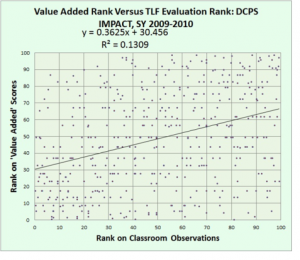 Another question to ponder is whether the district’s use of the EVAAS value-added system, especially since Superintendent Grier’s arrival in 2009, is actually reforming the school district as he and other district leaders have for so long now intended (e.g., since his Superintendent appointment in 2009). Houston Independent School District (HISD). (2015a). State of Texas Assessments of Academic Readiness (STAAR) performance, grades 3-8, spring 2015. Retrieved here. Houston Independent School District (HISD). (2015b). State of Texas Assessments of Academic Readiness (STAAR) end-of-course results, spring 2015. Retrieved here. Sometimes events happen that seem to be disconnected, but after a few days or weeks, the pattern emerges. Consider this: On October 2, [U.S.] Secretary of Education Arne Duncan announced that he was resigning and planned to return to Chicago. Former New York Commissioner of Education John King, who is a clone of Duncan in terms of his belief in testing and charter schools, was designated to take Duncan’s place. On October 23, the Obama administration held a surprise news conference to declare that testing was out of control and should be reduced to not more than 2% of classroom time [see prior link on this announcement here]. Actually, that wasn’t a true reduction, because 2% translates into between 18-24 hours of testing, which is a staggering amount of annual testing for children in grades 3-8 and not different from the status quo in most states. Not at all. Here comes the pattern-maker: the federal tests called the National Assessment of Educational Progress [NAEP] released its every-other-year report card in reading and math, and the results were dismal. There would be many excuses offered, many rationales, but the bottom line: the NAEP scores are an embarrassment to the Obama administration (and the George W. Bush administration that preceded it). For nearly 15 years, Presidents Bush and Obama and the Congress have bet billions of dollars—both federal and state—on a strategy of testing, accountability, and choice. They believed that if every student was tested in reading and mathematics every year from grades 3 to 8, test scores would go up and up. In those schools where test scores did not go up, the principals and teachers would be fired and replaced. Where scores didn’t go up for five years in a row, the schools would be closed. Thousands of educators were fired, and thousands of public schools were closed, based on the theory that sticks and carrots, rewards and punishments, would improve education. In fourth grade mathematics, the only jurisdictions to report gains were the District of Columbia, Mississippi, and the Department of Defense schools. Sixteen states had significant declines in their math scores, and thirty-three were flat in relation to 2013 scores. The scores in Tennessee (the $500 million winner) were flat. The District of Columbia made gains in fourth grade reading and mathematics, but not in eighth grade. It continues to have the largest score gap-—56 points–between white and black students of any urban district in the nation. That is more than double the average of the other 20 urban districts. The state with the biggest achievement gap between black and white students is Wisconsin; it is also the state where black students have the lowest scores, lower than their peers in states like Mississippi and South Carolina. Wisconsin has invested heavily in vouchers and charter schools, which Governor Scott Walker intends to increase. No wonder Arne Duncan is leaving Washington. There is nothing to boast about, and the next set of NAEP results won’t be published until 2017. The program that he claimed would transform American education has not raised test scores, but has demoralized educators and created teacher shortages. Disgusted with the testing regime, experienced teachers leave and enrollments in teacher education programs fall. One can only dream about what the Obama administration might have accomplished had it spent that $5 billion in discretionary dollars to encourage states and districts to develop and implement realistic plans for desegregation of their schools, or had they invested the same amount of money in the arts. “Unfortunately, we don’t have either,” and we likely never will. Why this is the case is also highlighted in this post, with Greene explicitly citing three main sources for support: the recent oppositional statement released by the National Association of Secondary School Principals, the oppositional statement released this past summer by the American Statistical Association, and our mostly-oppositional blog Vamboozled! (by Audrey Amrein-Beardsley). Hopefully getting the research into the hands of educational practitioners, school board members, the general public, and the like is indeed “adding value” in the purest sense of this phrase’s meaning. I sure hope so! Anyhow, in this post Greene also illustrates and references a nice visual (with a side of sarcasm) explaining the complexity behind VAMs in pretty clear terms. I also paste this illustration here, which Greene references as originally coming from a blog post from Daniel Katz, Ph.D. but I have seen similar versions elsewhere and prior (e.g., a New York Times article here). Greene ultimately asks why Duncan is still staying so fixated on a policy, disproportionally loaded and ever-increasingly rejected and unsupported? If Duncan’s “magic VAM sauce, is a sham and a delusion and a big bowl of nothing,” his career would literally fold in. To read more from Greene, do click here to read his post in full.